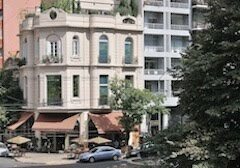 In the mid-1980s, when Argentine currency was truly volatile and inflation raged at figures up to 50 percent per month, my wife and I lived in a tiny Buenos Aires apartment where, on a student budget, we had to make our money stretch as far as it could. Then, as now, Argentine businesses and individuals responded to their own deteriorating currency by purchasing US dollars – which we were fortunate enough to have – on the black market. At the time, this involved entering dark downtown offices where, in vaguely unsavory surroundings, we would exchange US cash and travelers’ checks (the latter at a rather less advantageous rate). Before the administration of President Carlos Menem (1989-1999) established a fixed one-to-one exchange rate that brought several years’ stability, legal exchange houses were far more bureaucratic and, from our point of view, highly disadvantageous. The ATM had yet to appear, and so-called cuevas (caves) were the only alternative. I don’t recall now how we made the initial contact with a cueva, but it always made me slightly uncomfortable, even though we never experienced any unpleasantness. 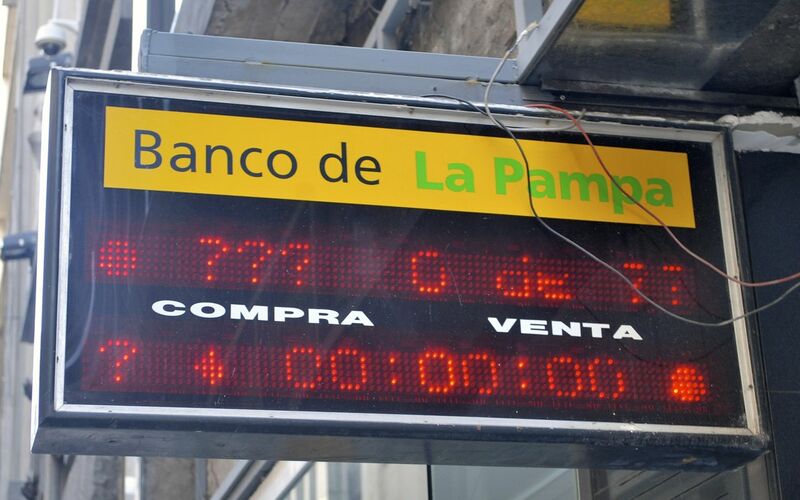 Today, because of the Argentine government’s cepo cambiario (currency clamp), it’s back to the future. 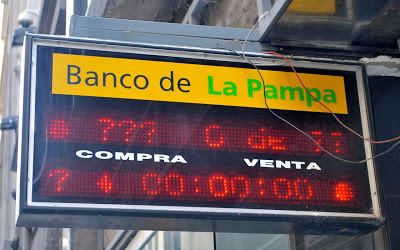 Despite efforts to plug the dike and monopolize the foreign exchange market, in order to pay its international debts – a strategy that’s had some short-term success but is unlikely to endure – there is once again a thriving black market in Argentine currency. And it’s not so surreptitious as I thought it might be before this trip. Earlier this week, running short of local cash, I contacted a friend with connections in the commodities market – where a shortage of foreign currency is making business difficult. He made a couple phone calls and gave me a name and address, after which I took a bus toward the downtown financial district. Disembarking, I walked down the Lavalle pedestrian mall to the sound of several arbolitos – currency hawkers known as “little trees” because they’re planted on the sidewalk, trying to draw tourists or others into nearby cuevas. On occasion, the government has cracked down on this, but none of the arbolitos I saw looked particularly worried. I had an appointment, though, and after showing my California driver’s license to the gatekeepers at a high-rise building, I took the elevator to an upper floor office, knocked on the door, identified myself, and took a seat in comfortable but by no means luxurious quarters. There, I handed over US$600 and, in return, received an envelope with 3,822 pesos; the rate of 6.37 per dollar (as opposed the official rate of roughly 4.8 per dollar) meant that my money was worth about a third more than an ATM exchange or credit card charge would be. I will acknowledge, in closing, that selling my dollars on the open market was technically illegal and, at the risk of hypocrisy, I will not suggest that readers should follow my example. In a difficult economic environment, though, Argentines have been doing this for decades, and the phenomenon is not likely to go away any time soon. I rarely stay in hotels here, but my contacts tell me that concierges now regularly purchase dollars or euros from their guests and then turn them over, at a smaller profit, in nearby cuevas. There appears to be one quasi-legal alternative of which a friend has informed me, called Xoom: “It's kind of the hottest thing for expats and frequent travelers right now. Thirty countries, you use it sort of like a cross between Paypal and Western Union, but it's got low fees and they give you whatever the local black market rate is for cash transfers.” There’s one convenient office in the Retiro neighborhood, a couple dozen in Buenos Aires province including Mar del Plata, and others in Chubut (Trelew), Córdoba, Corrientes, Mendoza, Salta and Rosario. Of course, there’s an opportunity cost involved in this. Other things being equal, I’d sooner make a withdrawal at the ATM that’s two doors from our Palermo apartment building, rather than make a special trip downtown. Unfortunately, though, these sorts of market distortions don’t seem likely to go away any time soon.